Ask anyone to identify a family business they might know, and most would probably name a small company in their neighbourhood or community. Perhaps the father and son-run electrician or the Main Street florist shop now owned by the second generation. Most companies in the world are young and small, and most family businesses are young and small (that’s always been the case, and that will always be the case). So, it’s easy to mistakenly conclude that family company equals small business. Few, however, would identify Walmart or BMW or any large or publicly traded company as a family company. It’s as if once a company grows large or goes public, it can’t possibly be family-controlled any longer. Built into this assumption is a bias that family companies are inferior performers and disappear with time or are perhaps just a step to larger, more professionally run businesses. In fact, most of the largest companies in any economy are family companies and, on average, family companies perform better than non-family companies and they survive longer. The largest family companies are an indicator that family companies perform very well, thank you, at a larger scale. 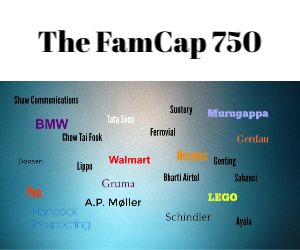 The Family Capital top 750 ranking of the world’s largest family businesses illustrates just how large these companies can get and suggests how much they contribute to the world economy. These large family companies wield significant influence in their industries and on the broader, global economy. The companies on this list have combined revenues of more than $9 trillion and directly employ around 30 million people. The list contains many familiar names like Ford and L’Oreal, but also many less well known. These businesses work in many different sectors and are geographically spread across the world’s economy. This should give us pause in assuming that family companies can only survive in certain sectors or in certain countries and cultures. Many of the 750 are based in countries with flourishing family business sectors, but increasingly are also based in economies where family businesses have begun to thrive in — most noticeably in China. Here a combination of very rapid economic growth and a growing number of companies moving to the second generation control have given rise to family businesses matching the size of their counterparts in much of the rest of the world. This list and the accompanying commentary adds to a better understanding of the dynamism and strength of the global family business ecosystem. An ecosystem that underpins the global economy and is set to grow even more important and influential in the years ahead. What I valute the most are “families in business”, properly organized and functioning systems able to run and renew their stakes according to events, always enacting their core values through commitment and direct dedication to ever-evolvimg businesses as well as via professional leaders whenever appropriate. Success through generations deals with vision, business acumen and managerial discipline, as well as continued and sustainable dedication to rational (and sometimes emotional) investments to build wealth.